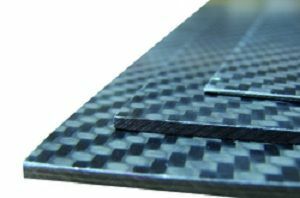 Carbon fibre sheet ECOTECH™, 350 x 150 mm, T= 0.8 mm. Carbon fibre sheets ECOTECH™ are made out of HT carbon fibre prepregs with a transparent epoxy resin matrix in press moulding. The edges of the plates are "rough sawn". The surface layers consist of 3k-fabric style 452 in twill weave 2/2 (fabric prepreg CE 8201-200-45). Depending on sheet thickness the core layer consists of 3k-fabric and/or UD-non-crimp fabric 0°/90° (bidirectional). Carbon fibre sheets ECOTECH™ can be milled, sawn or cut by water-jet. Please make sure to predrill the CFRP plates of the beam at the injection sites.